As you drive from Livingstone to the Victoria Falls, there’s a moment, before you get there, where you can see the mist reaching for the sky directly ahead of you. When you enter the park, before you feel the mist, you can hear the falls roaring in the distance. Before you can see the falls, you feel the air get moist and see the mist swirl around you as you pass the gate. Then, you stop, and your jaw drops as you see the massive curtain of water tumbling into the rift stretching ahead of you. But, this is just the beginning. The gorge continues on and on as you continue to walk. 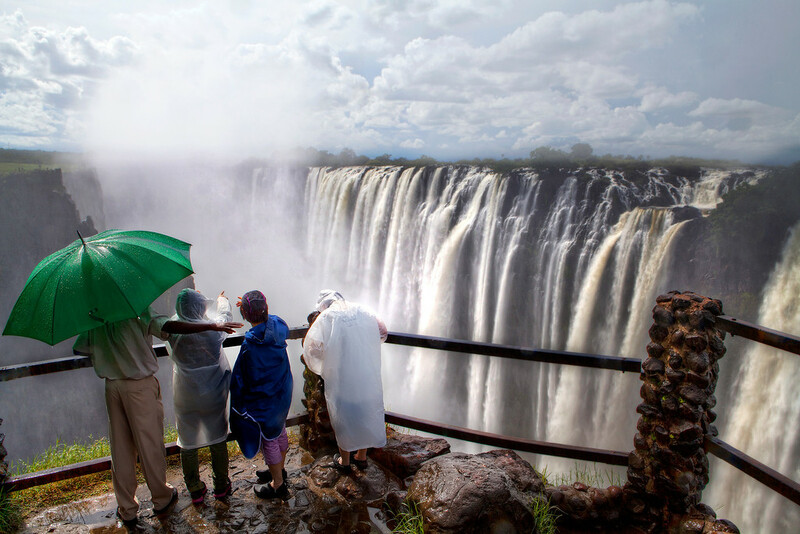 Eventually you reach the end of Zambia, totally soaked to the skin, camera gear screaming for mercy, and the curtain of water disappears into a cloud of mist where it crosses the border to Zimbabwe. It was at this point that I stopped and watched three tourists, far more prepared than me, with a guide and ponchos, gaze upon what is considered one of the seven natural wonders of the world. 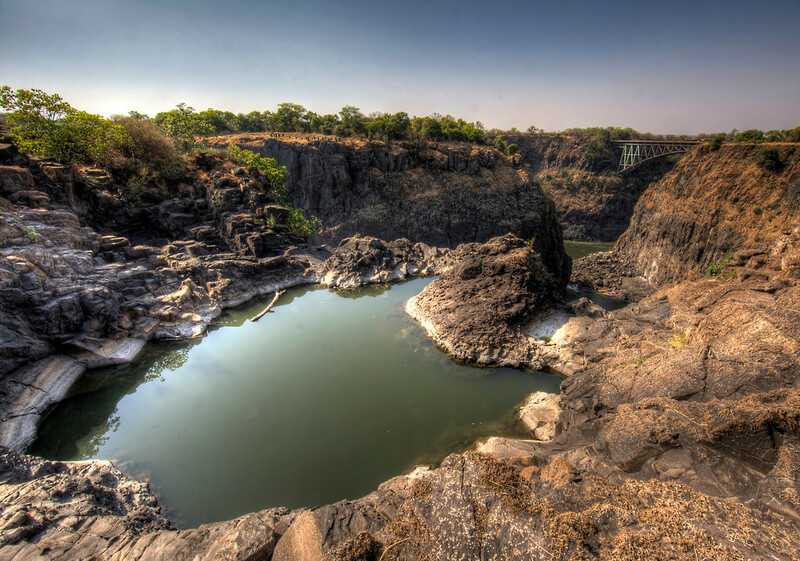 My first trip to Africa was entirely inspired by a forwarded e-mail showing people swimming in the Devil’s Pool right on the edge of Victoria Falls. In order to do this we had to go at low water, which was an incredible experience. However, I can safely say that a return at high water was necessary to truly appreciate the grandeur of the falls. Where you can see the fall in this picture is where we walked across the last time we were here, it was bone dry. This time, mist swirled everywhere and it didn’t take long for me to get completely soaked. I’ve been talking with my travel buddy a lot today about our future plans. 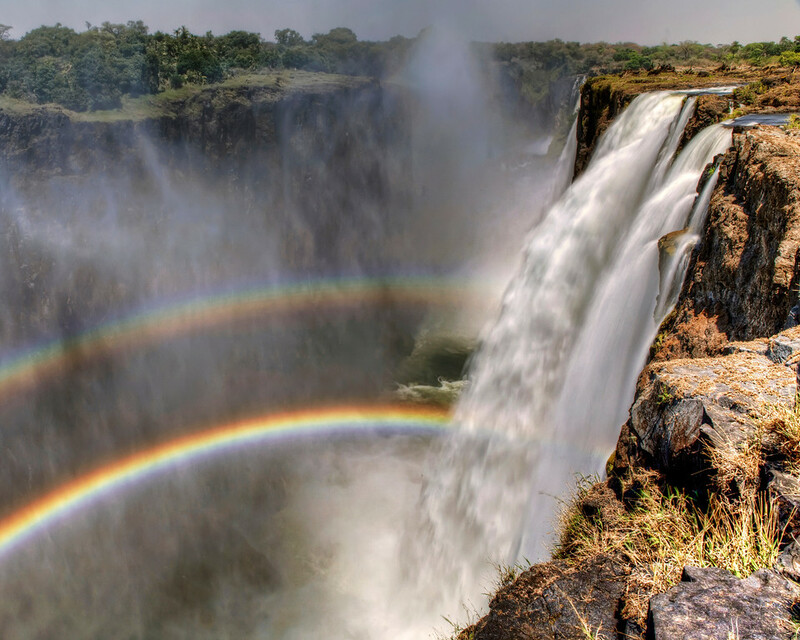 We’re confident that we’ll be going to Livingstone and the Victoria falls. This will be my second visit and her first. As you may be aware the last time I was there I went swimming in the Devil’s Pool. As it turns out, it looks like the water levels will still be low enough when we get there for us to take a dip atop the falls. I am very much looking forward to watching the look on her face as she takes the plunge. With that in mind, I thought I’d post a picture capturing what we’re likely to see as we make the walk to the Devil’s Pool. Last time, this beautiful double rainbow greeted me shortly before we prepared to swim across the top of that waterfall to the Devil’s Pool. 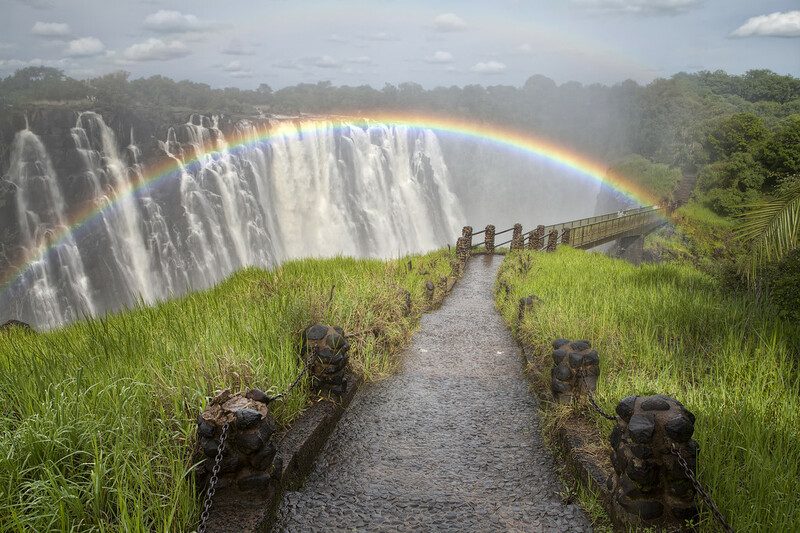 When I hung my head over the edge and looked down from the Devil’s Pool I realized that rather than a double rainbow there was actually a triple rainbow in the swirling mist. Next time I’m there I hope to get down to the falls for some sunrise/sunset shots. 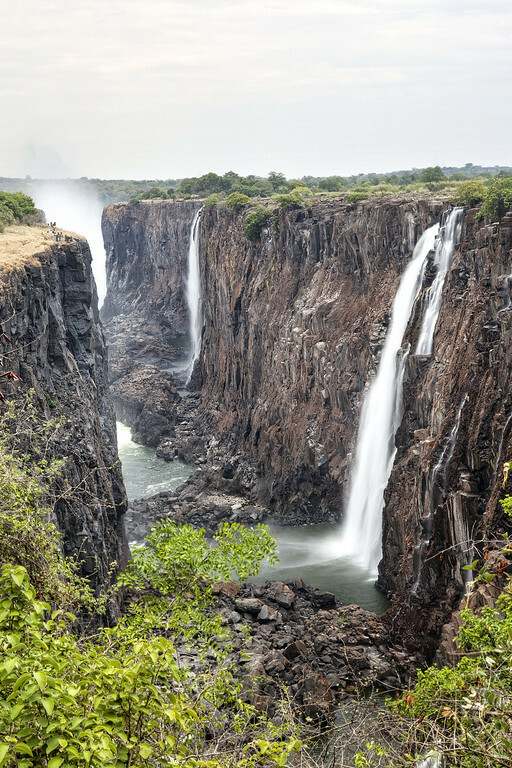 Victoria Falls at low water lets you really explore the falls. They have a real untouched feel about them. On one side there’s a simple path leading you past views across the Batoka Gorge. On the other side you can leave the path to walk across the top of the cliffs. There’s nothing to stop you walking right up to the edge, as you can see in this picture. I’ll be visiting Niagara Falls in March and wonder how it will compare. I’m expecting a lot more attention to be paid to safety, distancing you from the falls. I’m also expecting there to be buildings visible all around the falls. Maybe I’ll be pleasantly surprised. It’ll certainly make for great photos either way. 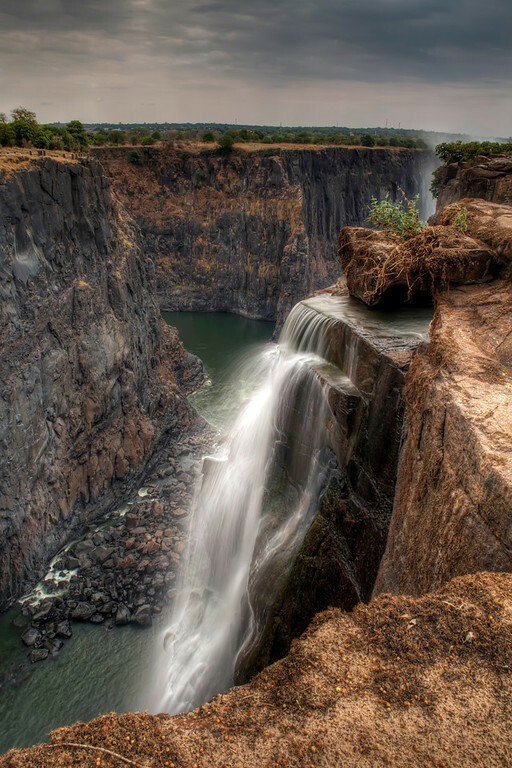 This is where the hike to the Devil’s Pool at the top of the Victoria Falls becomes a swim. The pool is located just on the other side of this waterfall. To get there, you have to swim up-stream against the current and then across. There’s a rope strung across in case anyone should succumb to the force of the water. Fortunately, it’s not actually a particularly difficult swim. 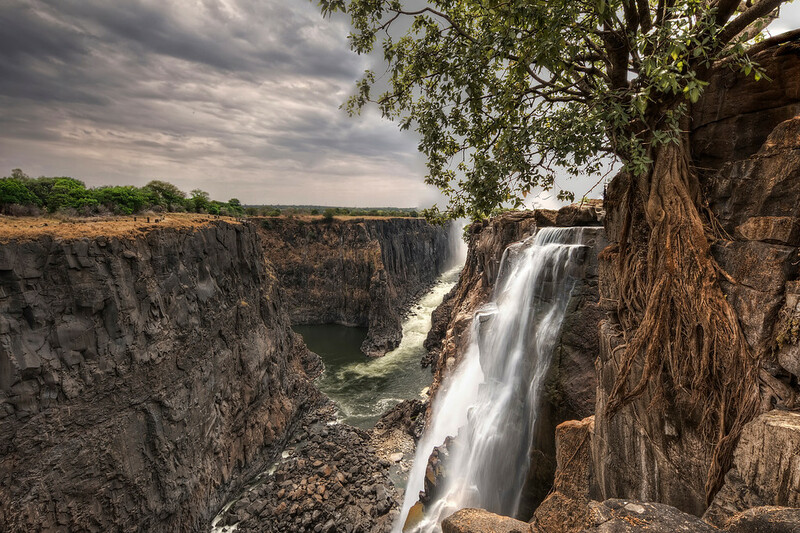 This is another shot from Victoria Falls. We came across this, the Angel’s Armchair, on the way to the Devil’s Pool. During higher water, when you can’t swim in the Devil’s Pool, people swim here. They jump off the rocks to get in. Water would be flowing down into it from above and then tumbling over the edge. In the distance you can see the bridge that joins Zambia and Zimbabwe. The river is the border. After he returned from the bar, still sporting his wild eyes and jittery demeanor, we managed to get out of him that he’d just been bungee jumping. He was definitely still buzzing and stayed that way for an hour or so. We left him at the bar to explore the curio market in Livingstone and returned an hour later. He was no longer there. Apparently, he’d hung around for another half hour then suddenly crashed and gone to bed. It was 3 in the afternoon. He reemerged at 10pm. I think he’d had a total adrenaline overload. Speaking of rafting, if you click this image to go through to my portfolio, then click it again and select the “O” size you’ll be able to zoom in and see a group of people preparing to go rafting from the Zimbabwe side. 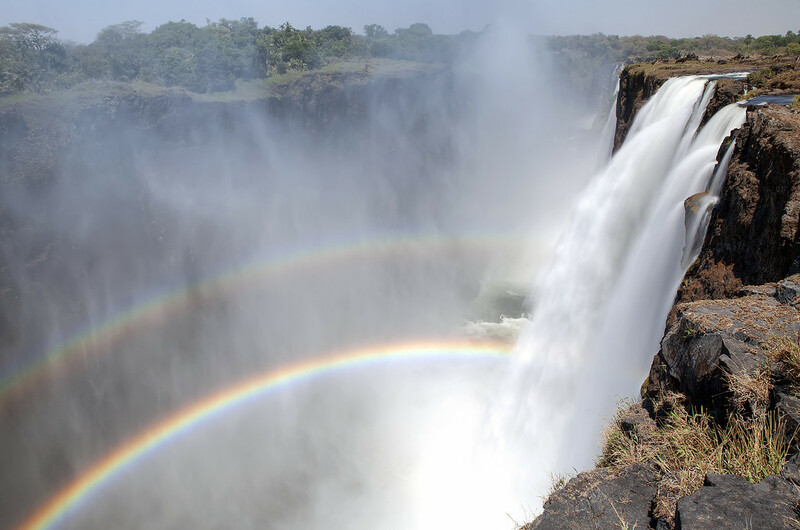 The Victoria Falls are incredible. 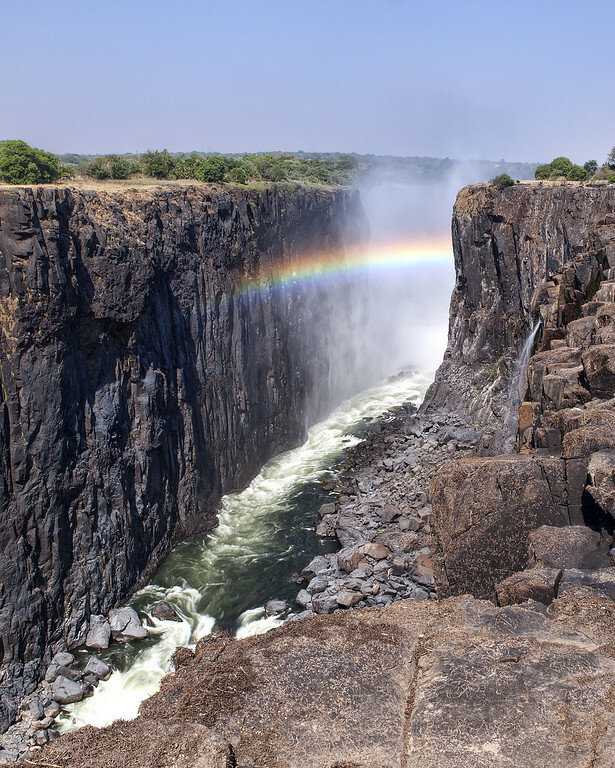 My friends and I were inspired to plan our recent trip to Africa, which included Cape Town, Zambia and Rwanda by a viral e-mail we received showing pictures of people swimming in the Devil’s Pool at the top of the falls. In order to do this we needed to visit during the low water season. The benefit of going in this season extends beyond swimming in the Devil’s pool. As a result of the low water we were able to walk across the top of the falls – providing multiple photo opportunities. 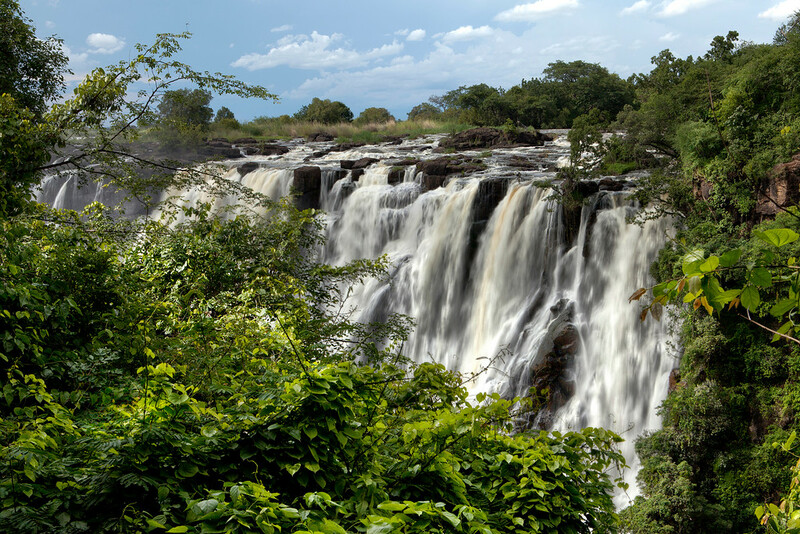 That being said I do feel a need to return at high water to get the full experience of the Mosi-oa-Tunya (the native name for the falls meaning “the smoke that thunders”). The below picture was taken on my second visit to the falls and left me with a huge adrenaline rush. I’m not a big fan of heights, and certainly not the 108 meter drop I was facing here. Still I decided that I needed to lower myself down onto this outcropping of rock to photograph this portion of the falls, which I believe is called the angel falls. Once reaching the ledge I stayed seated, gradually edging closer and closer to the edge, sliding my camera, and tripod ahead of me. The most nerve racking part was taking my lens cap off, I had already dropped a lens cap at the top of the falls on my first visit. It rolled within a foot of the edge – a very tense moment for me. I would not have been allowed this leeway with the spot I was in here. In hindsight, I really should have taken off all my loose bits and secured them before moving out to the edge. In the middle of the picture you can see the area called the boiling pot. I’ll be posting another picture of this area in the near future. It’s from just below this point in the river where rafting trips start, on the category 5 rapids of the middle Zambezi.